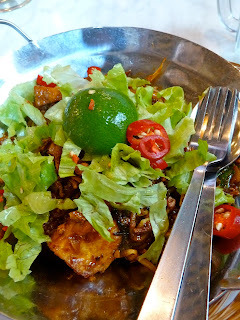 Mee Jawa is actually the name of a noodle dish which some say is a variety of the local Mee Rebus. The old school bicycles at the entrance caught my attention. The red went well with their signage. They had an airy, clean, simple, open, no fuss concept. Like. And bamboo appeared to be their feature material. The ceiling and lampshades were made with bamboo. 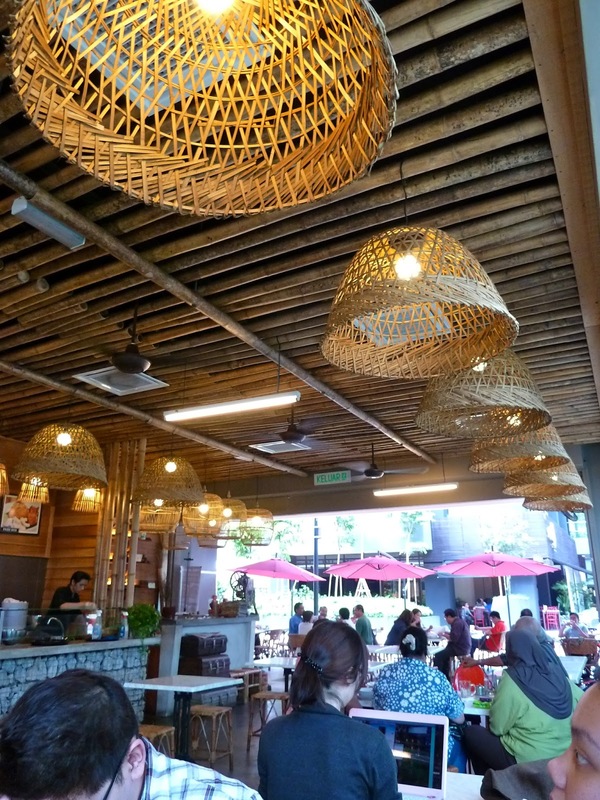 You cannot come to Mee Rebus and not order a serve of mee rebus, can you? For RM8.90, this was a generous serving of yellow egg noodles in gravy made from potatoes, curry powder, water, salted soybeans, dried shrimps and peanuts. Garnished with half a half-boiled egg, calamansi lime, spring onions, lettuce, chillies, fried tofu, fried shallots and bean sprouts, this version came with chicken slices, too. For the same price, the fried version of the mee rebus was basically the same stuff without the gravy but fried in dark and sweet soy sauce. 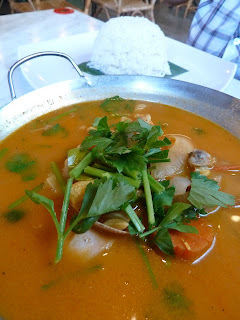 The Seafood Tom Yum with Rice (RM11.90) was too much for one person. Not bad for what they charged and perfect for people with a not-too-spicy palate. We also ordered a plate of rojak to share but I was so caught up with visiting a new place that I forgotten to take note of how much it was! Lots of crunchy peanut and sesame - like much! And yes, fail case again here, I do not recall the name of this dessert. 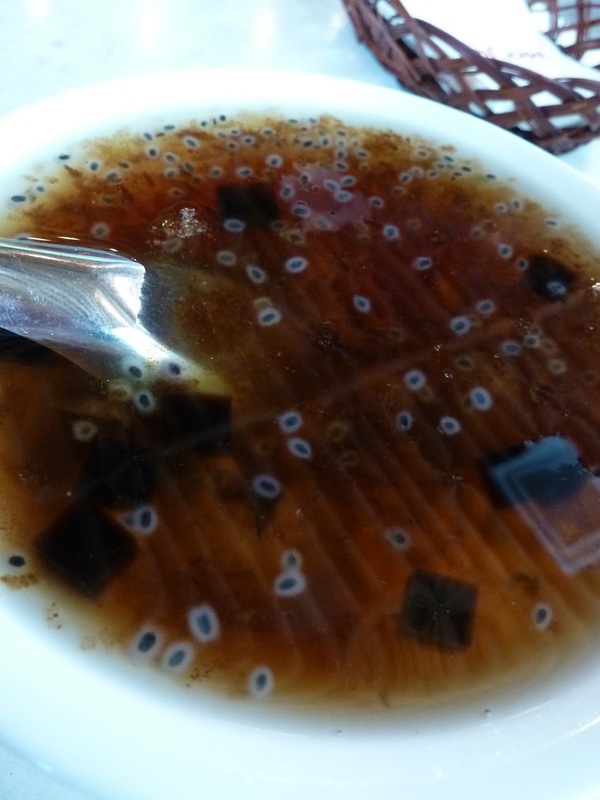 Some tongsui with grass jelly. The cooling effect helps balance the heaty fried food. A1-G2-09 Solaris Dutamas, 1 Jalan Dutamas 1, 50480 Kuala Lumpur, Malaysia. Happy 56th Merdeka Day, Malaysia!